Every child dreams of fantastic and compelling adventures in the company of his family and maybe parents too! So come and visit us during the weekend of 12 and 13 May 2018! 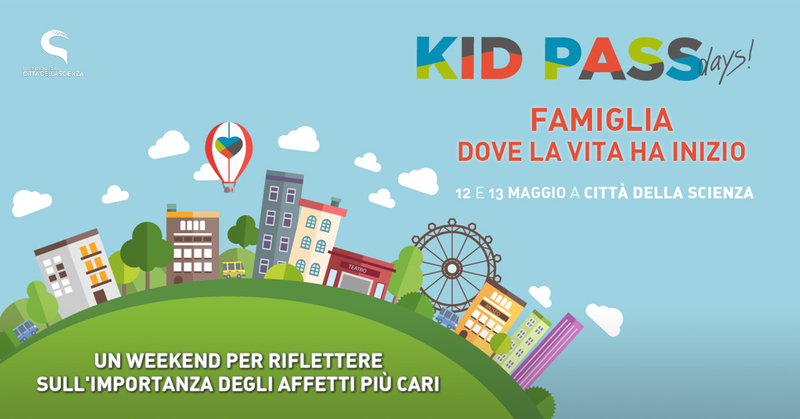 As usual Città della Scienza will participate in the fourth edition of Kid Pass Days, the most important Italian marathon of family-friendly activities and events dedicated to children from 0 to 12 years. A rich program of events, laboratories, scientific demonstrations, activities all dedicated to the family because sharing time with those you love, learning and having fun is the most precious thing. Having fun with your family is important as well as thinking about important topic such as organ donation. In fact, to save life, you do not need superpowers … just a signature is enough. As part of the “Partenope Dona 2 ° Edizione” project, the information point “Donating the organs: a hero’s choice“ will allow you to discover how organ donations work and adhere to the donation by filling out a simple form. What are you waiting for? Choose Life! How to describe the human body if not comparing it to a machine? Just as in any machinery every gear works in function of all the others, in our body every cell, every nerve and every organ works to make the whole machine efficient. But how is the human body structured? Where are the vital organs located? And what are the connections between the various bodies? Participate in – “Localization” and “language” of the organs – and learn to understand the most important signals that our body sends to us every day. How much do you know about blood groups? With “AB-Zero-AB blood”, test dummy blood samples (synthetic), evaluate reactivity against anti-A, anti-B and anti-Rh sera and discover the different types of cells that populate human blood . Concerning the theme of donations, “Donate the organs, give life …”: what does it mean to donate an organ? How you do it? Why is it necessary to do it? Discover the answer to these and many other questions and create an organ-gadget to donate! A “small” gesture changes your life! Are you keen on kites? Have you ever built one? Try it together with your parents by participating in the workshop “Family kite”: and feel the extraordinary emotion from seeing fly onethat you have built with your own hands ! And staying with the theme “parents and children”, integrating the new technologies with good dexterity discover together with your parents “Nintendo Labo“: turn a simple piece of cardboard into something different, a motorcycle, a fishing rod, a plane or whatever you image! Then, add a Nintendo Switch console to bring them to life and enjoyment is guaranteed! Win a race, catch a fish, play … With Nintendo Labo, everyone can experience the joy of mounting, playing and discovering. Have fun watching the workings of your creations: you could even invent new ways to play with Toy-Con! At the start of the weekends dedicated to Natura 2000, the main tool of the European Union policy for the conservation of biodiversity! It is an ecological network spread throughout the Union to ensure the long-term maintenance of natural habitats and threatened or rare species of flora and fauna at Community level. A series of activities will take place in Città della Scienza to talk, introduce and celebrate Natura 2000 Day!